Planting garlic is something I strongly recommend for everyone. It’s an easy plant to grow and has many uses. This is an update to the information in my Herbs for Texas book. Planting: Fall is best, but can be planted in early spring. In Dallas, I plant between October 1 - October 15. Height: 12 inches - 4 feet, some even taller. 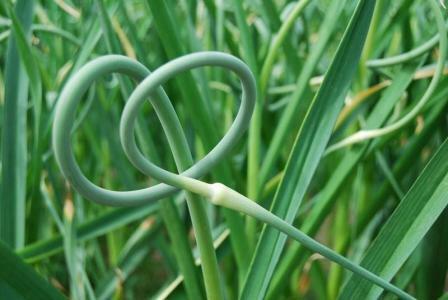 Bloom / Fruit: Some garlic has twisting and serpentine flowering stems or scapes that are very decorative. Others have straight flower shoots and some have no flowers at all. For larger bulbs, cut off flowering stems as they emerge from the foliage. Growth Habits / Culture: Strap-like leaves and underground bulbs with many cloves. Flat gray-green leaves. Cool weather is important for garlic. To grow a successful crop of garlic, start with well-prepared soil full of compost, rock powder and organic fertilizer. Purchase big healthy bulbs, hopefully organically grown ones, and break them apart into cloves. Each clove should be planted 3 to 4 inches apart about one inch deep in clay soils and two inches deep in sandy soils. Pointed end up is best but garlic seems to grow fine if the cloves are laid in sideways. After planting the cloves, cover the planting area with about 2 inches of shredded mulch. This is also a good place to use your partially completed compost. The new garlic bulbs will start to grow right away and you will see green shoots before freezing weather begins. A little frost burn to the foliage tips is normal. During hard freezes the plants can be covered with hay or floating row cover for protection, but that’s usually unnecessary. Garlic can be planted from large or small cloves, solid bulbs called “rounds” that didn't form cloves or from small bulblets that form around the bases of bulbs. Some cultivars form seeds in the seed heads that can also be used to grow new plants. Problems: Few, if any than occasional slug nibbles. Spray if necessary with Garrett Juice. Watering too long, poor drainage and wet soil will cause bulbs to rot. Harvest Time: Varies, but should be done as the leaves start to turn brown. It’s bad advice to wait until the tops turn brown and fall over. At that point the bulbs will be over-mature and often split open like a flower. At this point, food value will begin to diminish. Garlic can’t be stored in the ground as onions can. Days to harvest range from 90 to 180. Harvest / Storage: For larger bulbs, cut the flower stalk off as soon as it starts to emerge. The second method is to let the flower grow up and to cut it off before opening. Then hang it upside down to dry and use as dry arrangement material. The third method is to allow the seed heads to mature and open. Collect the small bulblets before they scatter or you’ll have garlic everywhere. When the leaves first begin to turn yellow on the tips in early summer, the bulbs are ready for harvest. Don’t wait until the entire top is brown, because energy and food value is used up as the foliage deteriorates. Dig the garlic out gently with a turning fork. You can cut the tops off or tie or braid them and hang in the garage or a partially shaded place to dry. Store in a cool, dry area. 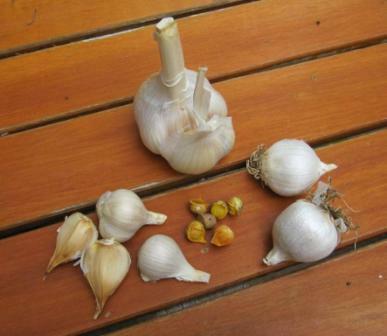 Use your garlic freely but save some of the larger bulbs for the next year’s planting. Medicinal Uses: Garlic is taken for the prevention and treatment of colds and bronchitis. It is said to help also treat lead poisoning, help normalize blood pressure, kill bacteria, detoxify blood, and is a natural antibiotic. Garlic is said to increase endurance and to be useful in easing the pain of earaches, removing skin blemishes, and of course – warding off vampires! Landscape Uses: Garlic is a beautiful ornamental plant or for use in mass plantings or intersperse in the perennial or rose garden. Other Uses: Deters many insect pests. For mosquito control - pour or spray garlic oil into standing water, stagnant ponds and other wet breeding spots. It will control mosquito larvae quite well. Spraying the air with garlic tea works as well as the toxic chemicals to get rid of flying adults. Mosquitoes can also be repelled for approximately 20 days by broadcasting dry granulated garlic at about 1 lb. per 1000 square feet. General Insect Control: Organic gardeners for years have interplanted garlic among ornamental landscape plants as well as food crops to ward off various pests. Tomatoes seldom have spider mite problems when garlic is planted nearby. On the other hand, garlic is reported to slow the growth of beans and peas. Garlic tea sprayed on plant foliage before heavy insect infestations works as a powerful repellent to most problem insects and many diseases. Gardeners use garlic tea by pouring it on fire ant mounds, and claims excellent results. When hot pepper oil is added to the garlic, it becomes a mild but effective broad-spectrum pest repellent. Fungicidal Control: Garlic has significant fungicidal powers. It will aid significantly in the control of anthracnose, powdery mildew, downy mildew, rust, tomato blight, brown rot on stone fruit, and other disease problems. Even the scientists like Charles L. Wilson with the US Department of Agriculture report that members of the garlic and pepper families have effective fungicidal components. Insight: Garlic is one of the world’s most health giving foods, an important medicinal herb, a key ingredient in homemade insect spray, and a good looking landscape plant. Garlic should be a staple of every garden. Cloves are great for seasoning all kinds of foods or for roasting and eating whole. 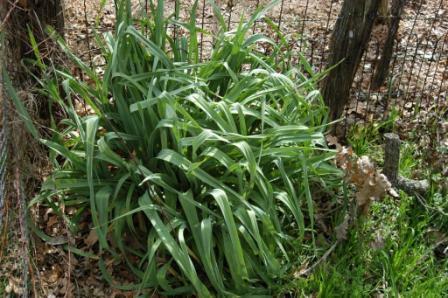 Young garlic greens are prized by cooks and chefs for use as a chive-like garnish for numerous dishes, including garlic pesto. Besides tasting good there is scientific evidence confirming the health benefits of garlic. Notes: Giant garlic, also called elephant garlic, Allium scorodoprasum, has milder flavor than true garlic and produces a fist size bulb. It is actually a leek, but its culture is the same. Garlic can grow botulisms when stored in oil too long. It is best to use garlic oil soon after making. Garlic is too “hot” for those with gastrointestinal problems.